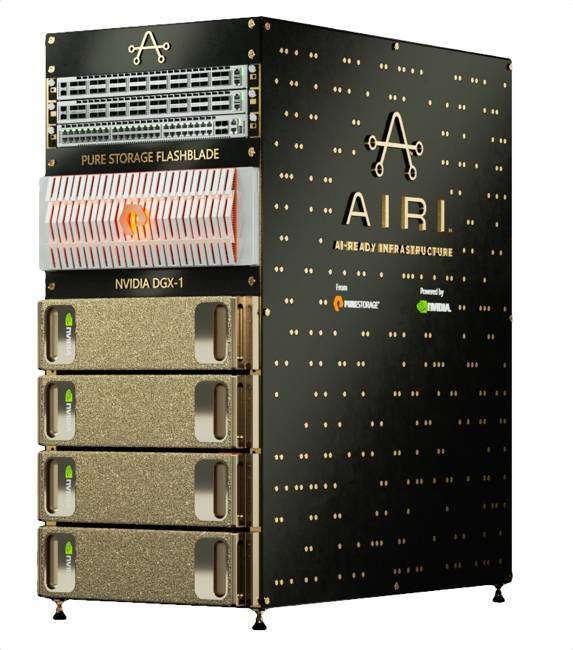 AIRI's rack is meant to be an object of desire in your data centre. To connect to the outside world, there are a couple of Arista 100GbE switches supporting GPUDirect RDMA. This enables a direct and fast path for data transmission between the GPUs and FlashBlades using PCIe features. The interface between FlashBlade and the DGX-1s is file-based: NFS. Each DGX-1 draws 3.2kW of power, so you're looking at near enough 13kW before factoring in storage and networking and the Intel compute silicon.